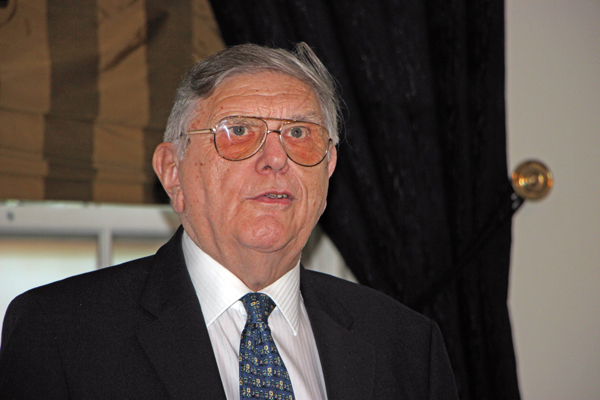 The BCI Enterprise was launched at Osset Hall a short distance from Ensignbus headquarters at Purfleet. 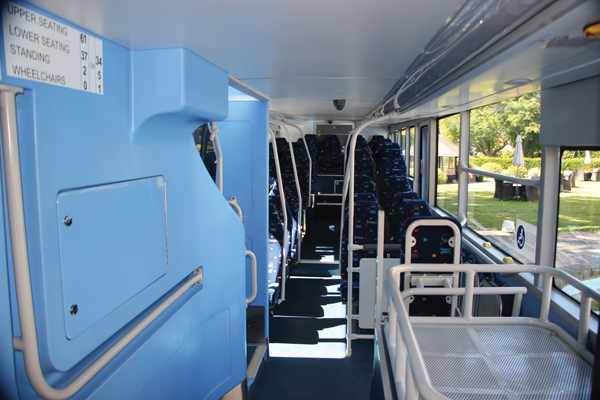 The lower deck of the Enterprise showing the blue mouldings specified by Ensignbus and the rising floor and ceiling lines. The lower deck saloon from the rear. BCI developed the staircase to meet Ensign’s needs. The rear of the BCI Enterprise. The upper deck of the Enterprise with the theatre style seating. 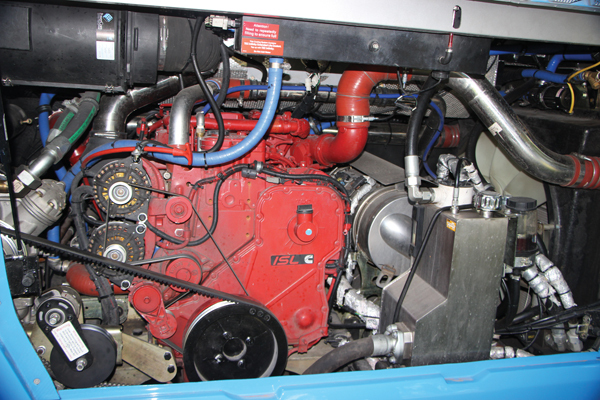 The Enterprise is powered by a Darlington built Cummins ISL 8.9-litre Euro6 engine rated at 380hp and mounted in line. Ensignbus has taken delivery of four of the 12.5m BCI’s which it will use on private hire and rail replacement work. Vantage Power CEO, Alexander Schey. Ensignbus provided Vantage Power with this 2000 Volvo B7TL Plaxton President to help develop their retrofit hybrid system. Beneath the engine cover on the Vantage Power B7 President is the B320 hybrid unit. 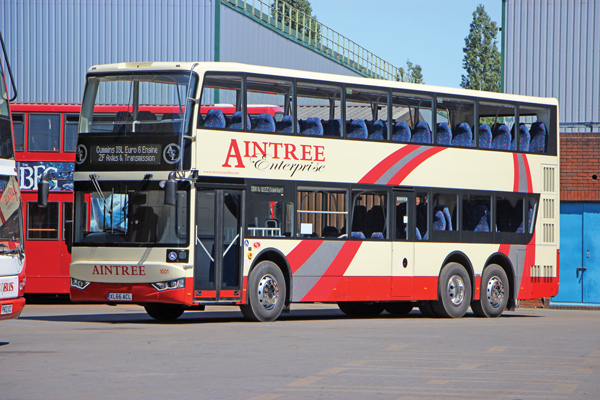 Aintree Coach Lines is the first retail customer to purchase an Enterprise from Ensignbus. The lower deck of the Enterprise for Aintree Coach Lines. Stuart Jones has been to Essex to see the first products produced for the UK in China by Bus & Coach International, an Australian business. 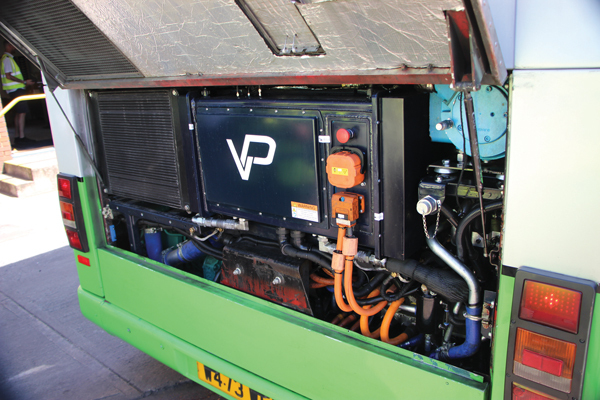 He also took a look at a Volvo B7TL retrofitted with the B320 hybrid package by Vantage Power with the tempting prospect of a 40% saving on fuel. The niche for very high capacity double deckers capable of carrying around 100 passengers on schools, private hire, rail replacement and similar work is not a huge one but it does exist and since the demise of the Optare/East Lancs Olympus on the Volvo B9TL 6×2 chassis there has not been a new option, short of full sized luxury coaches such as Van Hool’s Astromega and the VDL/Berkhof Synergy, offered in the UK to fill it. Ensignbus is best known for sales of used vehicles in large numbers but it has also held franchises for a variety of new vehicles in the course of its over 40 year history. Among those offered have been Berkhof, Padane and the integral FAP-FAMOS Charisma coach products. It has now commenced a new relationship with Bus & Coach International (BCI) an Australian company with joint venture manufacturing facilities in China solely dedicated to the production of buses and coaches for export markets. The origins of BCI date back to 1991 when it started selling Hino buses in Western Australia, and after expanding across Australia and building its own bodies, it started building chassis in Malaysia in 1997, before the fall in value of the Australian dollar led to a reappraisal. After going to China to seek a new chassis partner the opportunities for complete integrals became evident and Bus & Coach International (HK) Ltd was set up. Initially building in Wuxi, the operation and staff moved to Nanchang from 2007-2010 and in 2010 the entire company and staff moved again, this time to a new purpose built plant in Xiamen. In 2013, Weichai Power invested in the company and became the major shareholder. It already has 1,500 buses and coaches on the road in Australia and by the year end will have around 300 operating in New Zealand, where Ritchies recently placed an order for 78, including double deckers. It has also sold coaches into North America. I first met Boyd Denning and Ron Nazzuri at Busworld in Shanghai around eight years ago and at that early stage in the company’s development they already had a range of vehicles that stood out from the majority of others I encountered at the exhibition in their quality and suitability for operation in developed markets. 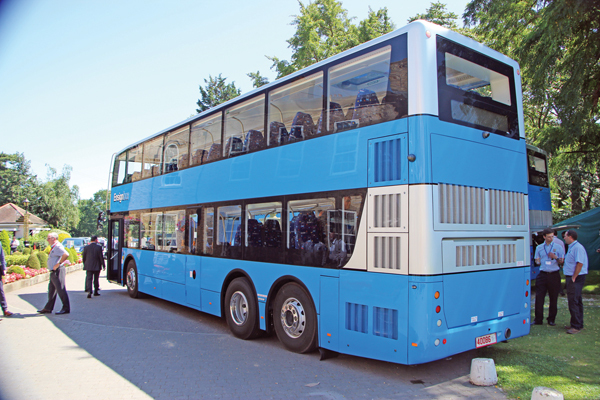 Speaking to Boyd in Purfleet, he said that the plant was building between 400-450 buses a year as production was increased gradually in order to ensure that quality levels were maintained. The plan is that next year the figure will rise toward the 600 mark although ultimately the plant has a capacity of 1,200 annually. The model range is huge, with various lengths of single deckers with steel or aluminium bodies, midi and full sized coaches, 4WD buses, mine buses and double deck buses and coaches. There is a joint venture with Mercedes-Benz under which it mounts coach bodies on chassis from Spain and Brazil. 2.55m and a rear overhang of 2.495m. The unladen weight is 16,285kg and the maximum GVW is 24,500kg. BCI produces on various chassis and makes extensive but not exclusive use of Cummins engines. The Enterprise has the Darlington built ISL8.9 E6 380 six-cylinder unit which delivers peak torque of 1695Nm at 1,400rpm and generates maximum power of 380hp/283kW at 1,900rpm. It is matched to the ZF EcoLife 6AP-1700B six-speed fully automatic. The axles are all from ZF. The front independent unit is the 8.2 tonne RL82EC IFS, the trailing axle is the steered 8.5 tonne RL85E and the drive axle is the AV132-90 with a differential of 5.13:1. Brakes are Wabco dual circuit pneumatic with automatic slack adjusters. 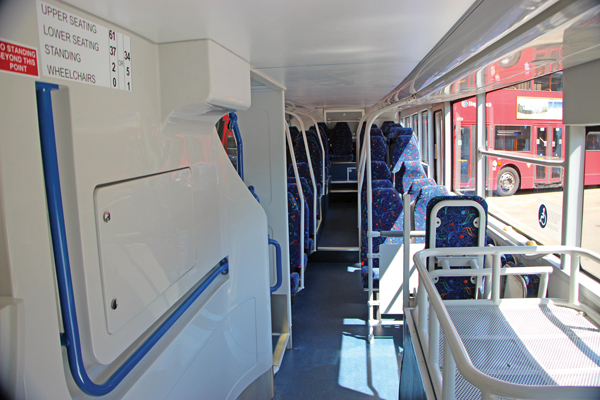 Bodily, the bus features a low floor on the lower deck to ahead of the drive axle and two further steps at the rear. 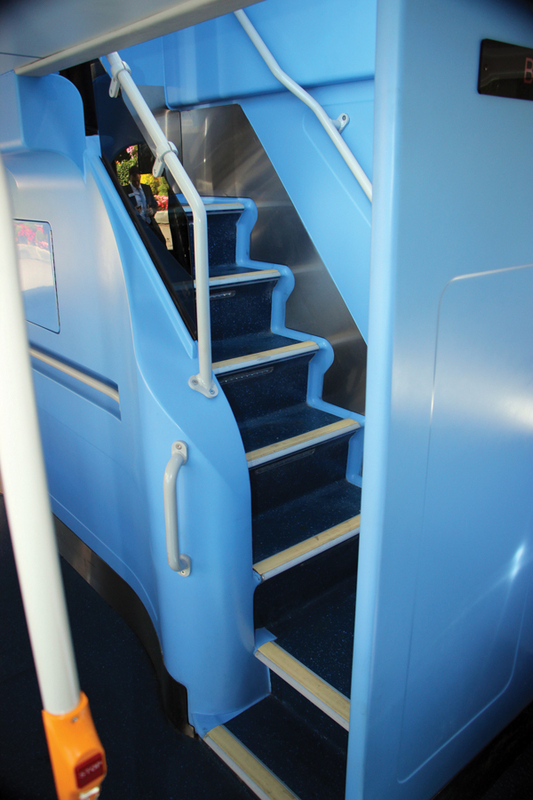 The staircase is on the offside and at Ensignbus’s request is curved at the top rather than straight, as would be BCI’s standard. The cab is open and there is an emergency door on the nearside beyond the wheelchair bay which has three tip-up seats. A luggage pen is mounted atop the nearside wheelarch. The first two seats on the offside beyond the staircase are priority seats and pole provision is good. Seats on both decks are high back units with three point integrated seat belts manufactured by the Australian Styleride company. Large window apertures keep it light and the standard of the mouldings was good. On both decks the floors slope upwards towards the rear in order to surmount the in-line engine arrangement. When you look at the seating from the front of the upper deck, there is a pronounced theatre effect, which does help give a good view out. On the upper deck, the ceiling lining is plain and easy to clean with a single glazed vent at the rear. I would probably have preferred this further forward as the frame sits below the main ceiling height and with the decreasing depth of the ceiling toward the rear people are more likely to knock their heads on it, as I did. Air conditioning is the Thermo King DD-C 1004 system providing 40kW of heating, 38kW of cooling and convection along the walls of both decks. Certification is to Class 1 and it is PSVAR and ULEZ compliant. 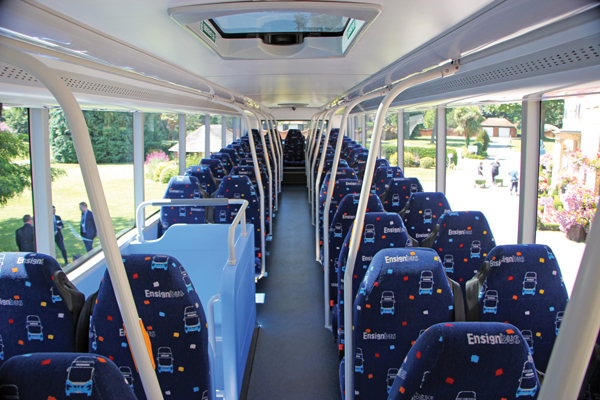 Ensignbus wanted to achieve 100 passengers and this has been done, albeit this figure includes three tip up seats and two standees, some standees being a requirement of Class 1 certification. The double front door fitted counts as two doors; had the capacity been any more than 100 a third door would have been a legal requirement. It’s not like the old days when COIF allowed Ensignbus to certify former Hong Kong tri-axles for 103 passengers. Upper deck seating is provided for 61 with either 37 (+ two standees) or 34 (+ five standees plus a wheelchair) on the lower deck, or that is what it says on the bus – I reckon 61+34+5+1 equals 101 so it may not be correct. The initial batch delivered consists of five buses of which four are joining the Ensignbus fleet and the fifth has been ordered by John Cherry’s Aintree Coachlines fleet. It is likely the Ensignbus quartet will be licensed in September with new ‘66’ plates. 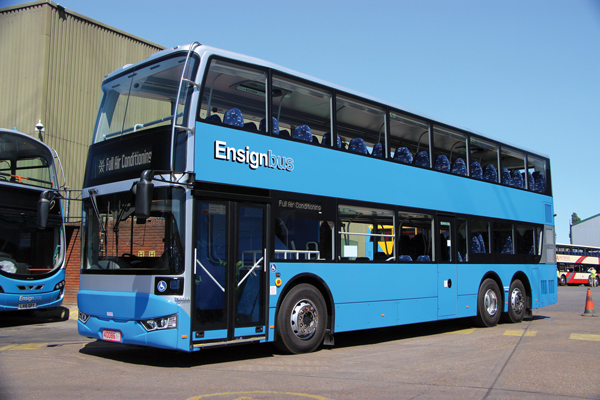 As well as the 12.5m three-axle buses, Ensign is also set to take delivery of a batch of 12 two-axle 10.8m city buses with 6.7-litre Cummins engines, ten of which will be used on the network, probably mainly on the 73 and 83 services. The other two buses will be available for sale. Peter could not yet give me a price for this model. 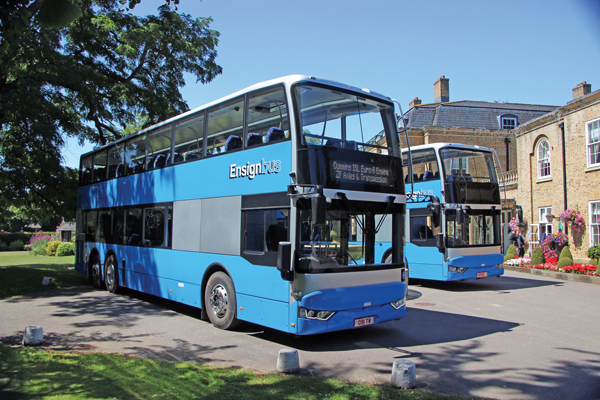 In the Ensignbus fleet, they will replace seven B9TLs and three B7TLs with the B9TLs replacing the remaining Tridents in the private hire fleet. I understand that glazing between the two models is standard. I rode on one of the Enterprises from Osset Hall to Purfleet and found it a comfortable and stable ride. There were no rattles or shocks and even on poor surfaces at speed the window shimmer was very minimal. Sat at the front of the upper deck I thought how well the air conditioning was coping with the sweltering heat, and when I got to the rear I found that it was even cooler. At six foot tall I did run out of headroom a little short of the rear of the upper deck and it was a similar story on the lower deck. 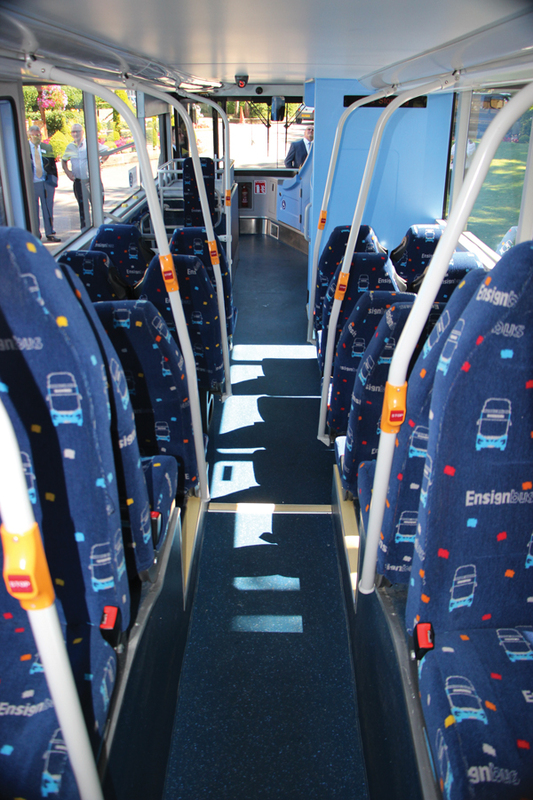 Ensignbus admit (though they are what they ordered) they are not happy with the rake of the seats on the offside, which have backs angled at 105% rather than the 112% of those on the nearside, in order to enable the required capacity. BCI has now sourced a different seat that will provide greater comfort without loss of capacity and this is necessary because they do make you feel as if you are leaning forward when you sit in them. Operators I spoke to were largely positive about the potential for the Enterprise, though there were criticisms of some detail areas in the finishing, some wires protruding from a bell push and the old fashioned windscreen wipers. As well as launching the BCI, Ensign took the opportunity to provide more information about the hybrid repower product being developed by Vantage Power in which they are involved. 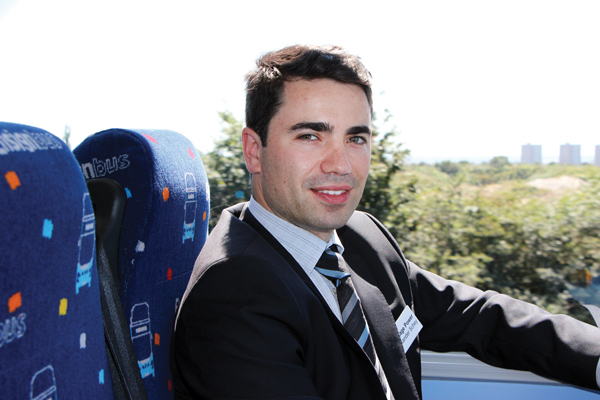 CEO, Alexander Schey, explained that, after accomplishing a project to develop and drive an electric car the furthest one had ever been driven, he had set up Vantage Power with Toby Schulz in 2011 to develop a hybrid retrofit package for buses. 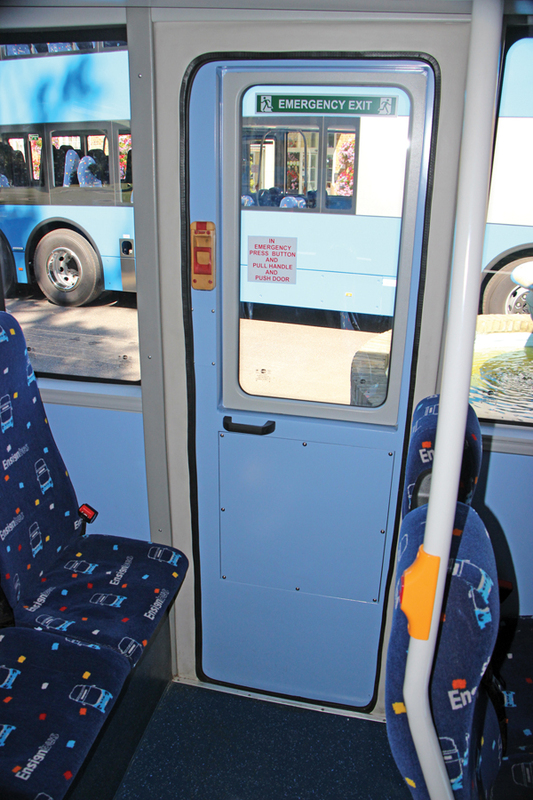 They made contact with Ensignbus who provided them with a 2000 Volvo B7TL to use as a development vehicle and work started on the system in January 2013. That bus is now on the road and once test work is complete it will be refurbished and put in service on Ensignbus routes, in addition to demonstration duties. On the Ensignbus network it will be considerably the oldest decker running, as once the all BCI buses mentioned take to the road the oldest deckers will be 2008 models (bar some B7TLs on a contract until next April). In addition to Ensignbus, Vantage has a number of investors, the biggest of which is the Marshall Group, which has considerable bus bodybuilding experience, and its CEO, Robert Marshall, is the Vantage Chairman. 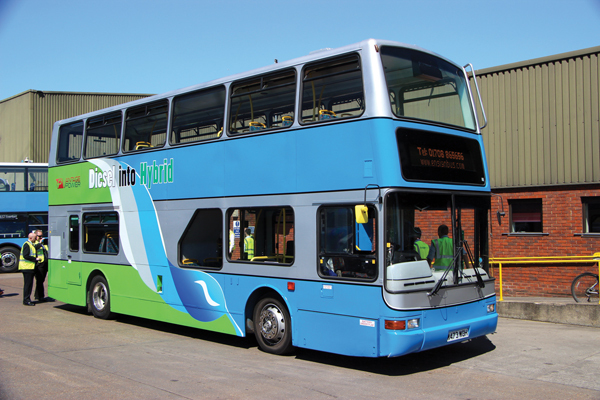 It now employs 35 engineers and has the B320 system fully developed and ready to sell to operators looking to offer green credentials and save fuel without the initial expenditure currently associated with buying new hybrid powered buses. The fully modular B320 series-hybrid system installed compromises a Cummins ISB4.5 185hp/136kW diesel engine, a permanent magnet generator, a 125kW lithium ion battery pack with integrated liquid cooling, and a 280hp electric drive motor with single stage epicyclic gearbox, as well as an engine and hybrid cooling system with electrically driven fans. Alexander explained that it has a full telemetry capability with 6,000 data points streaming information into the cloud. With this information the system can deliver automatic fault reports and diagnostics. Helping the B320 system to achieve fuel savings is the incorporation of an exhaust gas energy recovery system. The conversion kit on its modular frame can either be installed by Ensignbus at Purfleet or supplied to an operator for them to self install. It is designed to be a plug and play system. Once the conversion has been completed I was told that the only mechanical items unreplaced are the rear axle and the door mechanisms. The system will available for installation in the Volvo B7TL from December this year, taking it from Euro2 to Euro5 in the process. Vantage is already well advanced on conversion packages for the Volvo B9TL and the ADL Enviro400 which will take them to Euro6 level. The B9TL should be available from the second quarter of 2017, with the Enviro400 following prior to the end of the year. Systems for the Scania N230UD and Wrightbus Gemini2 are promised thereafter. TfL has placed an order for six conversions based on 2004/2005 buses that are just about to undertaken. These will be allocated to Go-Ahead London, Arriva and RATP-London United. The Plaxton President bodied Volvo B7TL looks externally, apart from the promotional livery, like any other, but take a trip on it and you soon see how it is different. I joined a half hour trip around Essex that showed how successfully the installation has been achieved. OK, there’s no denying that the journey was accompanied by a background of the rattles you associate with a 16 year old bus, but this only emphasised the smoothness with which it changes between diesel and electric only mode. There is no judder or jolt, only the engine note when the diesel is functioning gives the game away, and it did seem to spend a fair amount of time in electric mode. Vantage claim that it will run for up to 4km in engine off mode, which Alexander suggested would enable the Oxford Street area to be completely emission free. On top of this, it has good acceleration. We weren’t given precise prices but we were told that the conversion is a quarter of the cost of a new hybrid, which, if we take a hybrid price at £300,000 suggests around £75,000. On top of this there is the rental cost of the batteries, supplied as a package, which I was told are charged at £600 per month for the first five years, with the telemetry included in that price. That’s £36,000 for the five years. Providing the monthly fee is paid the warranty can be transferred to subsequent owners. Whether operators can make that stack up on a first generation low floor bus that delivers Euro5 remains to be seen; I’d have thought interest in the forthcoming Euro6 options is going to be greater, depending on what they cost. As an introductory incentive, available until 31 August, anyone ordering a B7TL repower can get £2,000 per bus discount and anyone putting down a refundable £1000 deposit against a B9TL or Enviro400 repower can also get a £2,000 discount per bus. The weather was scorching and there was plenty to see at Purfleet with the new BCI, the Vantage repower, Ensign’s considerable and varied used stock, the commercial workshops, and the large active heritage fleet which seems to contain about every major type I can remember running for London Transport. On top of this, there is the service bus fleet which together must make Ensignbus one of the most varied, if not the most varied, bus operations in the UK. Early Chinese built imports to the UK did not completely convince operators, though it seems most are still running. This has changed of late with Yutong, Scania’s Higer bodied Touring and Ankhai’s sightseeing double deckers all finding enthusiastic customers and now BCI is more proof that the number of Chinese built buses operating in the UK is set to keep increasing. The high capacity UK decker market isn’t huge and the height means this isn’t a coach you can take to the Continent, so it will be interesting to see how the Enterprise sells, Peter says he’ll be happy with 15 a year. As for the 10.8m service bus, I’m looking forward to seeing that. The big decker market remains London and Ensign is well placed to provide support; and support will be key to the success of such a project. Very interesting but a pity that ORSETT in Essex has be transposed into OSSETT in Yorkshire – hardly a 30 minute bus ride from Purfleet!